It’s no secret that when we visited 13th Floor Haunted House Chicago a few weeks ago, I was a bit disappointed with the experience. While the production values were good, there was little character interaction, a lot of sound and light pollution, and a fairly overt “homage” to another haunted attraction I’ve been to. Things felt amiss, but I chalked it up to Freshman year growing pains. So when the opportunity to visit the original 13th Floor Haunted House in Denver, CO arose, I jumped at the chance to see if my assumptions were correct. And while there is still one issue I have, 13th Floor Haunted House in Denver lives up to its reputation. 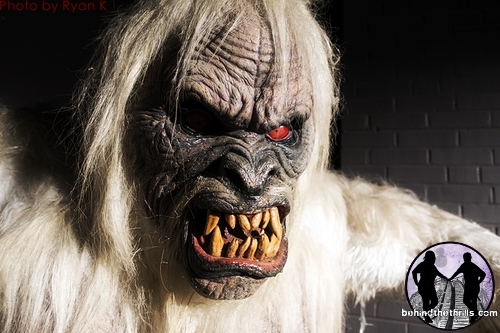 13th Floor Haunted House in Denver, CO has spawned three other 13th Floor haunts across the US, as well as other haunted attractions. With a size of over 30,000 sq ft, it’s consistently rated one of the top haunts in the nation. According to Marketing and Sales Coordinator Kaitlyn Jaffke, customer responses are used to help identify and shape changes in the attraction between seasons. Depending on feedback, about a third of the experience is changed to deliver a fresh nightmare each year. This year two houses are featured: Undead: The Possession and Dwellings of the Dead. The sets and props in both attractions are totally immersive and breathtaking. While the sets are a little random at times (particularly in Dwellings of the Dead), there is an idea weaving things together, and it all fits under the umbrella theme of encountering different ghouls and monsters that you might find on the infamous 13th Floor. The environments are intricate, expertly lit and detailed, and I often found myself gazing at the sets just as much as the props and actors. In particular, the simulated swamp is a stroke of genius, really capturing the feel and essence of wading through a marsh without actually getting wet. The spider room, complete with dangling webs and multiple voracious arachnids, is also an incredibly effective room, guaranteed to unsettle and terrify all who pass through. 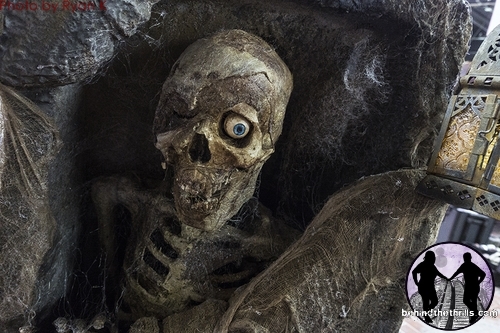 Special and practical effects are expertly used to give environments life and help visitors suspend disbelief, and the props themselves are almost worth the cost of admission alone. Never have I seen so many oversized creatures and monstrosities in one place, especially moving ones that are so close to the audience. There are multiple points where they interact directly and intimately with visitors. One especially memorable scene involves a giant snake head that blocks the hallway and follows visitors from its hole to strike when they’re most scared. And where 13th Floor Chicago had some issues with both sound and light pollution, the Denver location has much better control over keeping unwanted light and noise out. Overall, the environments feel more like something you’d see at a major theme park than a local haunted attraction. 13th Floor only uses between 40 and 50 actors on a given night, but with so many animatronics and puppets in the house, there are no dead areas. The actors are very effective, having a strong grasp on their characters. Actors wait until groups pass before resetting, again helping to sell the world as a living, breathing place instead of just walking through a local haunted attraction. You never know where the next monster is lying in wait for you. Actors fly overhead, grab at you through walls, and jump seemingly out of nowhere to startle and scare. However, one issue did stick out during the the walkthrough, however. Much like 13th Floor in Chicago, 13th Floor Haunted House in Denver uses a few sets and special props that very strongly and explicitly reference those in other major haunted attractions. While average haunt goers won’t catch them, to someone who’s been to those other haunts, it immediately took me out of the experience. It was particularly disappointing, as the other (what I presume to be original) content was so good in comparison. I can only hope that this is minimized (if not completely stopped) moving forward, as it’s clear that the designers and builders have the knowledge and creativity to blaze their own path and craft a uniquely horrifying experience. Overall, 13th Floor Haunted House in Denver delivers on the hype. The screams never stop, and visitors are in for a high tech, high terror experience. It is recommended to visit during the week for a shorter wait and a bit more theatricality from the cast. Weekends can get quite busy, with wait times approaching three hours during particularly busy nights. If you ever find your way out by the Mile-High City in October, make sure you stop by and see for yourself what’s creeping about in the darkness of the 13th Floor. 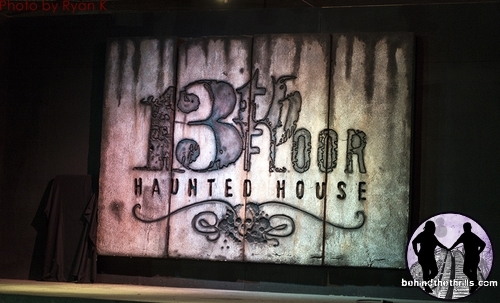 13th Floor Haunted House runs on select nights in September and October, and features other special events throughout the year. For more information about The 13th Floor Denver, or to buy tickets, click here!